Most submissions we receive from Eastern Europe tend to be by death and black metal bands. Punk rock, for whatever reason, has never been as big in that region at least when it comes to bands known internationally. Bankrupt from Budapest, Hungary, are proof of that. 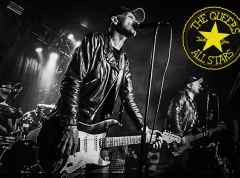 They've been around for 15 years as a band and have their roots firmly in melodic punk in the vein of The Bouncing Souls, Face To Face and other 90s legends, but I can't recall having heard their name mentioned in any context off the top of my head. Regardless, the promo blurb says that they have recently adopted influence from surf guitars and rockabilly on top of their melodic punk foundations. Their latest EP "Rewound" has four tracks which successfully combine the beach/surf rock and rockabilly vibe together with anthemic choruses and an upbeat tempo. Introductory track "Clint", for example, is pure surf rock that instantly reminded me of local Danish band The Surfing Henchmen, but then "Rewound" is straight back to easy-going melodic punk (here sounding mostly like Bouncing Souls), whereas "Weekend" attempts to combine the two. I've never been a fan of rockabilly/surf rock, but the inclusion of the catchy choruses and the higher tempo that this song brings shows that the style can sound pretty good nonetheless. Finally, "Happenstance" closes the seven-and-a-half minute EP with another brief stab at standard 90s influenced melodic punk rock. It's nothing you haven't heard before, but it's a fun little track that's also catchy and bouncy, so you can't go wrong with that. 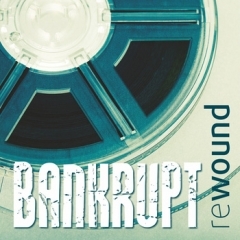 "Rewound" probably isn't the record that lifts Bankrupt into recognition, but it's a reminder that solid punk rock exists in Hungary just as much as it does elsewhere, even if we don't hear about it as often.